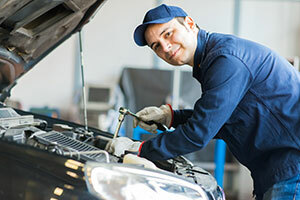 Preventative maintenance is essential to keeping your car running when you need it most. A dependable car, especially in the Arizona heat, is the top priority of most car owners. Discount Brake Tune and Lube is a certified Napa Autocare Center and will do your routine maintenance tune-ups including checking your oils, other fluids, brakes, belts, hoses etc. We will make sure your tires have the proper pressure and make you aware of any other issues we see. If you are like most people, your vehicle is one of your most prized investments. Not only that, but a properly-running car is vital in traveling to and from your job, school, or family activities. One of the best ways to ensure your automobile stays in good shape is to a schedule a regular tune-up with our team at Discount Brake Tune and Lube, an authorized Napa AutoCare Center. We offer Phoenix brake repair and full-service, bumper-to-bumper tune-ups in order to quickly recognize, diagnose, and repair potential problems. The mechanics at Discount Brake Tune and Lube are certified and trustworthy. We want to earn your trust and your business. We will give you our assessment of the repairs needed and you can choose when to repair them. Schedule your next tune-up today! To get your vehicle in tip-top shape, visit our ASE certified mechanics at Discount Brake Tune and Lube, an authorized Napa AutoCare Center. Contact us at (602) 667-3400 for an appointment in Phoenix, or call (520) 426-1500 to schedule an appointment at our Casa Grande auto shop, Discount Brake Tune and Lube.